Lindsay's on a mission to make living a plant-based life easy as vegan pie for thousands of Meal Mentor members. Meal Mentor was started by Happy Herbivore co-founders (and husband and wife team) Lindsay and Scott Nixon to be the solution they always wished they had when they started their plant-based life. They’ve been featured on The Food Network, New York Times, Vegetarian Times Magazine, Dr. Oz, Shape Magazine, Women's Health, and WebMD, among others. Happy Herbivore (the maker of Meal Mentor) is the original vegan blog and has been helping vegans around the world live delicious plant-based lives on their own terms for over a decade. Lindsay’s vegan journey started in her early 20s, when a serious health scare kicked her into gear. She realized she needed to start prioritizing her health, but that in order to stay on track she needed a plan. Not just any plan, but a plan that was easy to follow and fit with her busy lifestyle. What really is a plant-based diet? How can I cook more balanced, healthier meals? Why does vegan meal planning take so much time? Is this kind of diet OK for my kids? And, what the heck is for dinner?! To document her own journey and share her experiences, solutions and food experiments with other struggling new vegans, Lindsay created Happy Herbivore, now one of the leading blogs for plant-based recipes and vegan-focused weight loss. The blog went on to be a brand behind multiple best-selling vegan cookbooks and guides, along with the popular ‘Supreme Slimdown Blueprint Edition’ and ‘Bikini Blueprint’ programs. 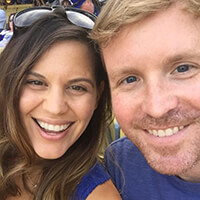 Lindsay understands what it’s like to struggle with making a healthy life a priority when you’re already juggling an 80-hour work week, laundry, family, a social life, and dozens of other to-do’s on your list, so she (with her husband Scott) created Meal Mentor. The Meal Mentor membership is Lindsay & Scott’s solution for putting a healthy vegan lunch or dinner on the table every day, and Meal Mentor is the culmination of over 12 years of creating recipes and testing. Using Lindsay's years of experience in the kitchen, combined with the latest scientific research, trends and medical advice, they are passionate about helping people use everyday ingredients to create healthy, low fat, vegan recipes that make eating well easy, affordable, realistic and delicious. Every Meal Mentor meal plan and recipe is made with a teaspoon of thoughtfulness, a pinch (or two) of research, and a heaped cup of love — so you can get back to living the best, healthiest version of your life.